The micro-textured, premium synthetic and fabric upper of the Nike Superfly 6 Pro FG wraps underneath your foot for a second-skin-like fit. A 2-part podular plate system utilizes chevron studs for speed in every step, while embossed speed ribs from heel to toe make your boot look as fast as you feel. Micro-textured, premium synthetic and fabric upper creates a second-skin-like feeling. Podular plates mirror foot&apos;s shape and provide responsive traction. Embossed speed ribs flow from toe to heel. Flyknit Dynamic Fit Collar links the foot and lower leg while leaving the ankle free to move. My son loves these for soccer. He says they are very comfortable. Debating on getting a third pair of Merc Superfly Pros. 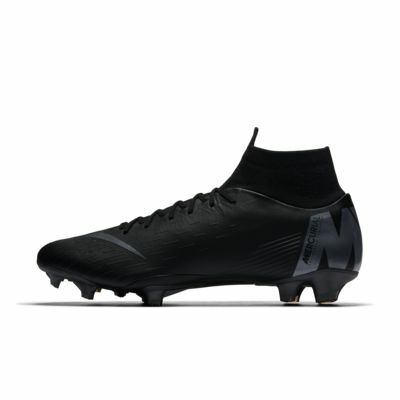 I tried ordering the Elite Superfly, however, I couldn't find a fit similar to the Pro fit. They were either slightly too small or slightly too big, within half a size. These are the closest to perfect outdoor competitive rec boots could be. The break-in period is minimal and the touch is outstanding, regardless of the conditions. Like all boots, they will give way in muddy conditions. When hot outside, your foot will not get too hot and when wet, your foot will stay relatively dry - better than expected. I did start using a sole insert for tournament days when it was necessary to wear boots for more than 2 hours. The comfort zone is about that before you start to feel the studs pushing back. I have the CR7 VI and ver VII and will probably pick up the Volt boots because I love that colorway. I bought these for my son, and they are so comfortable on his feet, he enjoys these!